Cooking fish in a sealed, airtight pouch is one of the easiest and healthiest preparation methods. Referred to as cooking "en papillote" -- the French term for the technique -- it usually calls for wrapping the fish in a parchment parcel and baking it in the oven. Foil works just as well as parchment, with the additional benefit that it's suitable for the grill. You can also use this method to cook fish straight from the freezer, putting a tasty meal on the table in just minutes. Rinse the frozen fillet portions under cold running water to remove any surface frost or icy glaze from the fish. Pat them dry with clean paper towels. 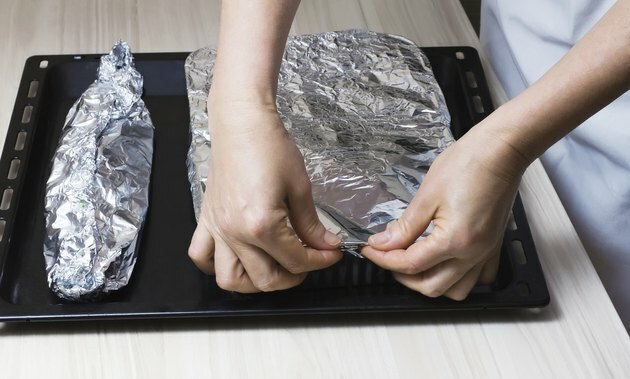 Tear a sheet of aluminum foil, making a rough 12-inch square for each portion. Brush or spray the foil lightly with your preferred cooking oil. Arrange each fillet in the middle of a sheet of foil, then lift up the edges of the foil and crease them together to make a seal. Do the same for each end, creating a loose package for each fillet. Preheat your oven or grill to 425 degrees Fahrenheit. Place the frozen fillets in their pouches on the grill's grate, or arrange them on a baking sheet and slide them into the oven. Cook the fillets for approximately 8 to 10 minutes, depending upon the thickness of your fillets and the number of fillets you're cooking. Remove the fish from your oven or grill and open the packages, then season the thawed fillets to your taste. Re-seal the packages and cook for another 8 to 10 minutes. Remove your fish from the oven or grill, and open the packages again. Carefully transfer each fillet to a plate. The juices in the package can be used to make a sauce or simply dribbled over each fillet. The fish fillets steam in their own juices inside the foil package, as light and flavorful a cooking method as could be imagined. To add flavors to the fish, you can arrange the fillets on a bed of fresh herbs or aromatic vegetables, or add a splash of wine or fruit juice to the package. Spices, dried herbs or seasoning mixes should be added midway through the cooking time, when the fish has thawed enough to begin absorbing flavors. Be careful when you open the packages. They'll contain enough hot steam to cause a serious burn if you aren't careful, and the cooking juices from the fish can scald your hands if they spill out of the foil.